Sharing with you, my readers, five sources of inspiration to brighten your week. If you’re stuck on ideas for your next updo (weddings, parties or otherwise), check out 51 Romantic Hairstyles from Brides. Think wind swept tendrils, chignons with loose strands, soft waves, voluminous curls, messy buns, chic ponytails and more. Add to this gauzy bows, floral embellishments, sparkly hairpins, crystal hairpieces and even a crown. With this guide in hand, you and your stylist can make a look all your own. Click here for the details. 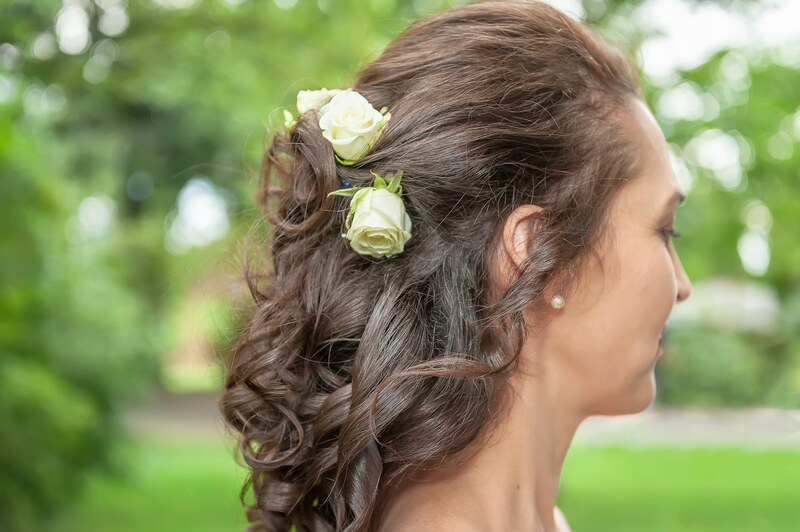 While we’re speaking of hair, a recent bride of mine, Ilyse, figured out a perfect low-cost, hidden way to wear blue on her wedding day: elastic hair bands. Her stylist worked one into her hair underneath all of those romantic curls (see feature photo above.) Simple and clever. Looking for the perfect small gift for your DIY-er? Here is something for under $15: A magnetic wrist band to hold loose nails and screws securely. I gave one to my husband over the holidays and am now looking for additional inspiration. Stay tuned. If you love the western landscape and black and white photography, stop by the City of Longmont Museum’s Ansel Adam’s Early Works Exhibit. Check out the silver gel prints and the gear used by Adams to capture Yosemite and other beautiful landscapes of the west. Catch up on your history and afterward, take your sweetie to the moon, literally on the second floor to see the moon rock. Then, head up to the third floor (even though it’s the kid’s area) for a view of Long’s Peak. The exhibit runs through May 26th and has a variety of related films and demonstrations to infuse a little spark in your date afternoon or evening. Hours and programs on website. Charles M.Schulz, American cartoonist and creator of “Peanuts” and Charlie Brown.